The moon Tethys is the third out of Saturn's large inner moons. With a diameter of 660 miles, it is also the third largest of these and the sixteenth largest in the solar system. It is situated 183,068 miles out from its host planet, which it orbits in just under two days. As you can see, it has a rather drab appearance and looks a bit like an orange. Its surface and, indeed, most of its interior is comprised of water ice. 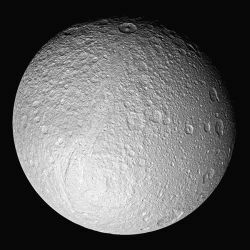 It is not known whether the moon Tethys has a rocky core, but, if it does, it would only be around 180 miles in diameter. 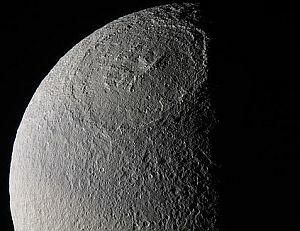 The surface of Tethys, being pure water ice, is extremely reflective, making it the second brightest object in the solar system, after Enceladus. Features found on the surface consist of cratered areas, smooth plains and rift valleys. The cratered areas are found on the moon's leading hemisphere and most of them are over 25 miles across and have a central peak. The crater Odysseus, however, is the odd one out in more ways than one. For one thing, it doesn't have a central peak. But, more importantly, it is its sheer size. With a diameter of 280 miles, it occupies almost two-fifths of the whole moon. It is considerably degraded, meaning that, over the millennia, the surface water ice has yielded, allowing the crater to start to blend into its surroundings. Nevertheless, its walls are still around three miles high. The smooth plains are found on the trailing hemisphere. Dominating them and, indeed the whole moon, is a huge rift valley. Ithaca Chasma is 1,243 miles long, 62 miles wide and almost two miles deep. It wraps three-quarters of the way round the moon and occupies one tenth of its total surface area. 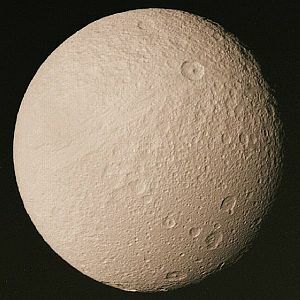 As this feature is diametrically opposite Odysseus, it was thought that it was formed as a reaction to the initial impact that created the crater. More recent observations have revealed, however, that Ithaca Chasma is actually older than Odysseus.